mothermade: Let’s hear those adoptee #validvoices #flipthescript! Add yours! 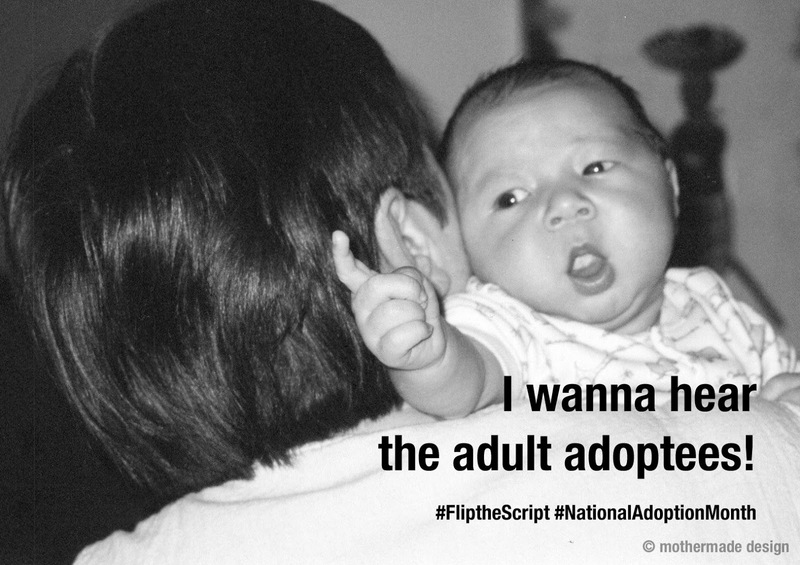 Let’s hear those adoptee #validvoices #flipthescript! Add yours! Telling one’s truth is exhausting! Adoptees are taking the mic and tweeting. #FliptheScript began at Lost Daughters when I posed a campaign for the month of November. My sisters were supportive and excited. We are a family of adoptees. Each of us has a different story to tell, and our family of writers runs the gamut … domestic adoption, transracial adoption, foster care, international adoption and more. Some of our sisters are adopted parents as well as adoptees. I am always amazed at the diversity of voices. November’s significance lies in a few adoption industry campaigns, National Adoption Month, Orphan Sunday and today … World Adoption Day. The wonderful talents in the adoptee family have converged to make sure our voices are heard and seen as #validvoices. Filmmaker Bryan Tucker (Closure), created a wonderful video featuring the Lost Daughters voices. Now, I look to you. Adoptees only. Join your family and tell your story below in the comments. Also note that I will be pulling out some of your comments to tweet this month. Let our voices ring out … loudly, honestly and collectively. While frustrated with my old woman confusion, my son did help me create a MEME; and yes, he is the baby in the photograph.